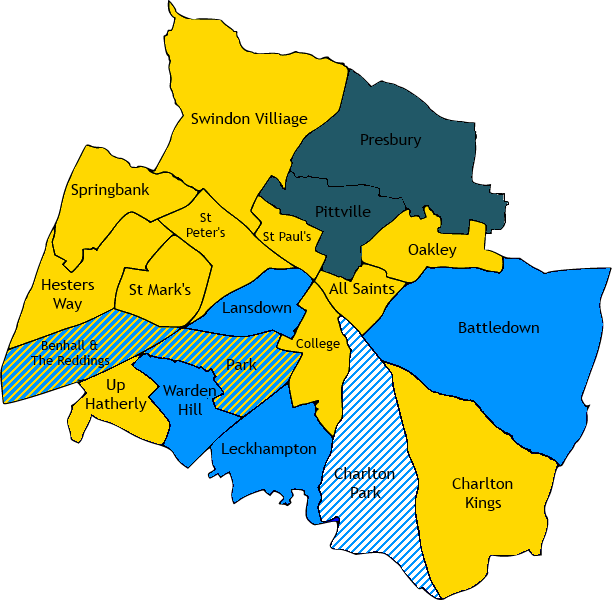 On 22nd May 2014 there were elections in Cheltenham, as in many other parts of the country, for local councillors. 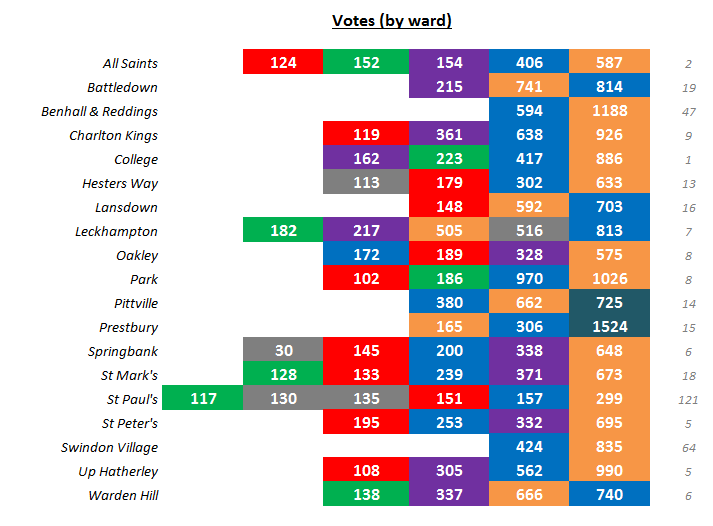 One councillor was up for election in each ward. There are 20 wards in Cheltenham but one of the wards – Charlton Park – did not vote as one of the candidates died shortly before the election. 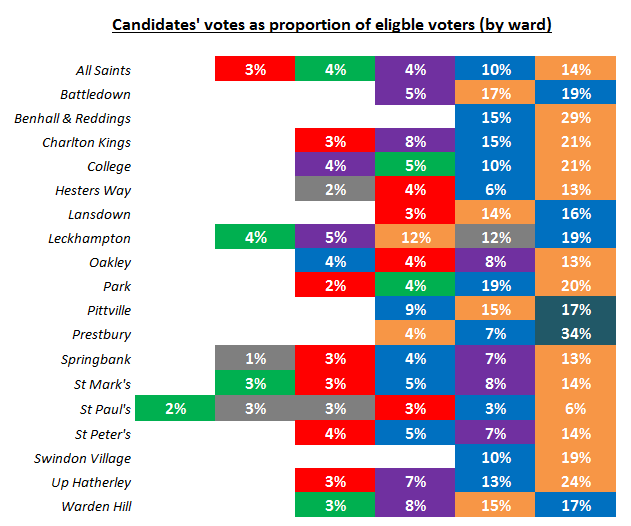 The other 19 wards did vote but there were hardly any changes in terms of which parties were elected; Park went from Tory to Lib Dem and Leckhampton from an independent to Tory. In addition, some of the parties fielded different candidates. The full results are here. N.B. “People Against Bureaucracy” are a local party. The results of the individual wards are displayed visually in the following pictures. The colours are the same as in the pie-charts above. 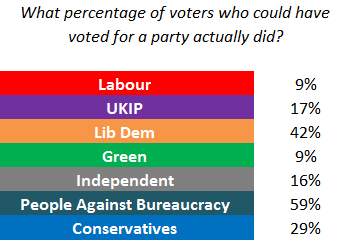 As voter turn-out can be quite low, it is interesting to see what percentage of those people they are representing (i.e. those eligible to vote in the ward) voted for them. N.B. The number in grey to the right is the number of spoilt ballots. 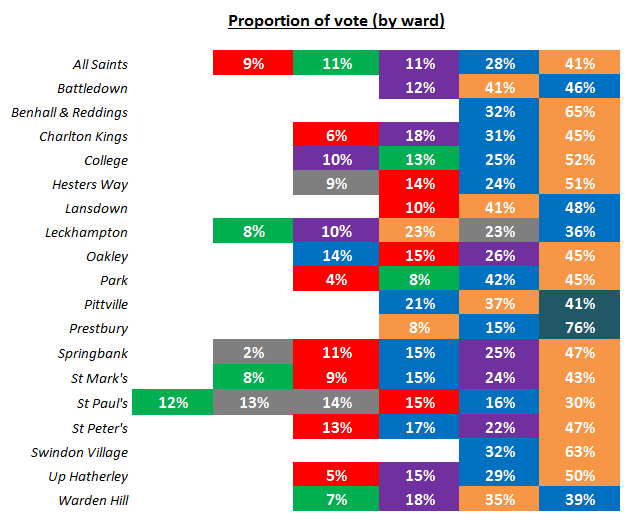 Each ward actually has two councillors of course, although only one of them were up for election at this time. The following map shows both the newly elected councillor and the other councillor which was not up for election this time around. A solid colour means that both councillors are from the same party. N.B. As Charlton Park is awaiting election one of the councillors has been drawn in white. It was previously conservative and is likely to remain so when the by-election happens. Edit 27th May 2014: The results posted on the Cheltenham Borough Council website were originally slightly incorrect due to a transcription error. Two of the figures had been changed and the changes have now been reflected on these diagrams. I also took the chance to make “People Against Bureaucracy” separate from “Independent”, as this seems more instructive.